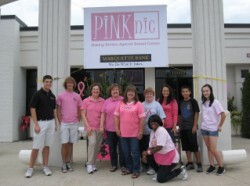 Marquette Bank employees collected over $9,200 to benefit breast cancer research during its 7th Annual Marquette Bank Employee PINKnic held in Orland Park. Marquette Bank held its 7th Annual Marquette Bank Employee PINKnic to raise money for breast cancer research and the American Cancer Society. The pink-themed, employee-organized picnic held at the bank’s Corporate Center in Orland Park officially launched Marquette Bank’s efforts to raise money for the Making Strides Against Breast Cancer Walk, where Marquette Bank will be a flagship sponsor. This year’s South Suburban walk will be held Sunday, Oct. 14, 2012 at Centennial Park in Orland Park. Over the past eleven years, employees and friends of Marquette Bank have contributed over $100,000 to the American Cancer Society through fundraising and participating in the Making Strides Against Breast Cancer Walk. Marquette Bank encourages neighbors and local businesses to participate in the walk or make donations to the American Cancer Society online at www.cancer.org/stridesonline. For more information about Marquette Bank, visit www.emarquettebank.com or call 1-888-254-9500.